Katy the Farmer’s Daughter You can’t resist that gal. Got a smile that’s sprinkled with sunshine. 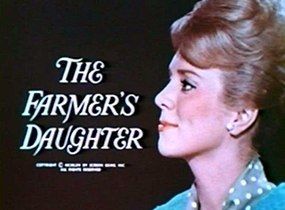 Look at the Farmer’s Daughter; She’ll perk up your morale. Her brand of charm is so disarming, Frowns turn upside down. We owe a debt to Sweden. She’s just what we’ve been needin’. So glad the Farmer’s Daughter came to town. This story loosely follows the plot of the 1947 movie from which it was named. A U.S. 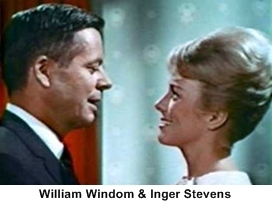 Congressman Glen Morley (William Windom) lives in Washington D.C. with his two young sons and his Mother Agatha Morley (Cathleen Nesbit). 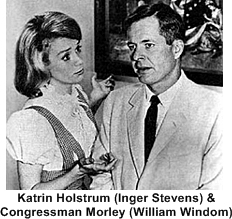 Along comes this naive farmers daughter Katrin Holstrum (Inger Stevens) from Minnesotan (the Congressman’s constituency) looking for an international job. The Congressman likes what he sees and hires her on the spot to be his children’s nanny (at that time called a governess). Well she not only cares for the children, helps out Mother, solves domestic and international crisis’s in the government but also manages to get Congressman Morley to fall in love with her. She accomplishes all this by using her down to earth charm and farm girl common sense. The romance between the two grows until in the beginning of the third season they get married. This is great news for them but not so much for the viewers. Ratings that season fell prompting a cancellation. In an unusual move however instead of just cutting the show off which was he norm, the studio allowed them to have some closure with Katrin adopting his sons and all of them living happily ever after … hooray for Hollywood!